For a knit-blogger, I don’t often blog about what I’m actually knitting. I’ll do my best to address that! I’ve been quite productive so far in 2010, as well as knitting samples for new patterns I’ve finished a few things I really like. Most impotrantly, I finally finished a long term UFO, in time for my sister Holly’s birthday next week. This is a top version of Stephanie Japel’s Saturday in the Part Perfect Dress from her first book Fitted Knits . The book I loved when I first got it, the designs are wearable and lovely, but quickly became frustrated with the insane amount of errata. I have made several projects from the book and this is definitely my favourite finished project so far. I modified just about everything – I couldn’t find an equivalent blend and weight of yarn in the UK (another of my gripes with the book) so I used Debie Bliss Cathay. The pattern has a recommended needle size of 4.5 mm, the yarn 3.75-4 mm but I felt this was gave a fabric that was too open and see through, so I went down to 3.5 mm. I re-did the maths accordingly. As it’s a top-down raglan, altering for a different tension was straightforward. I didn’t like the yarn, it’s heavy and splitty, this is why the top took me so long to finish. After working the sleeves I stopped following the pattern. I don’t remember there being mistakes, I just didn’t feel the need. I worked back decreases every 6 or 8 rows to the natural waist, then back increases. I added some front increases where the extra columns of mock cables started, and increases all around the bottom before starting the mock cable edging. You may notice that the mock-cable pattern curves above, rather then below the waist. IMHO the original resembles a pair of pants which is not a good look. Considering I pretty much winged it it’s an amazingly good fit, very pleased indeed. I hope Holly feels the same about it, she’s waited two years! Also made as gifts, two pairs of Ysolda Teague’s Veyla mittens from Whimsical Little Knits 2 in leftover Colinette Jitterbug. The pattern is very quick and the clever construction makes it so much fun to knit, I couldn’t put it down. The finished gloves are beautiful I think they make a really special gift. I got a skein of ‘Morello Mash’ from a swap with mooncalf and I’ve had 4 projects from it – two sets of Endpapers, an and these. ‘Morello Mash’ has more colour variation than ‘Velvet Leaf’ and I wasn’t sure whether this would work with the lace, but it turned out rather well. I made the small size and they are quite small even with Jitterbug, which I find thicker than the average 4 ply. Definitely have a think about your sizing if you plan to make them. 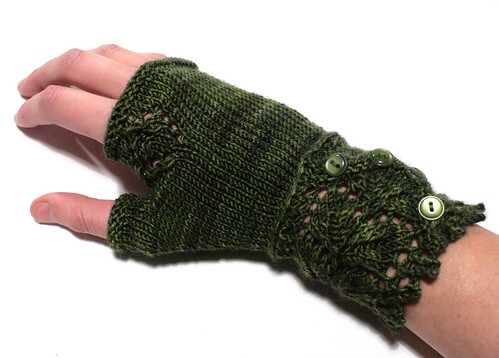 My most recent cast-on is Dapple by Kim Hargraves, from her summer book Nectar. I’m surprised at how few projects there are on Ravelry for Dapple, it’s an easy knit but the cables add a bit of interest, and the finished garment would suit most people. 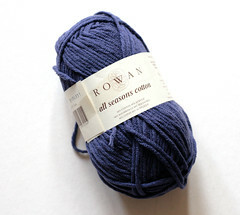 Very unusually for me, I’m using yarn I bought for this very project and the recommended yarn at that – Rowan All Seasons Cotton, as I got a great deal on it in the sales last January. I don’t have anything similarly coloured in my wardrobe (something to do with an aversion to navy caused by school uniform trauma) but I’m sure this slightly faded blue is a shade I’ll wear. I don’t love cotton and unsurprisingly I don’t love this yarn, it’s stiff and hard work to knit. That’s just my taste. It knits up quickly enough so I can live with it. 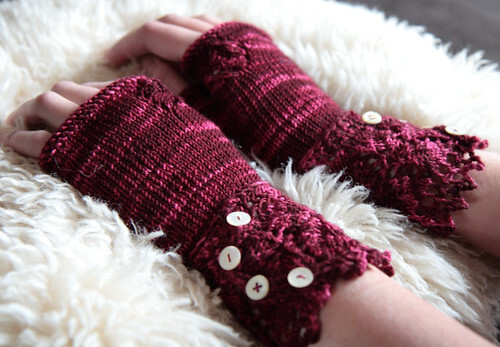 I think those Jitterbug mitts are the loveliest ones I’ve ever seen! I plan to buy more Jitterbug to make some for myself.